Aging is an ongoing process that literally begins following birth. Both physical and mental changes occur throughout every life stage until after about age 65 when the changes become even more pronounced. This process occurs unevenly and in very different ways among individuals so that evidences of aging become apparent early in some while others lead an active, healthy life far into what we consider really old age. Researchers are looking at all aspects of aging — both physiological and psychological — to identify those factors considered most important about causes aging but also what we do throughout life that impacts our state of health in old age. 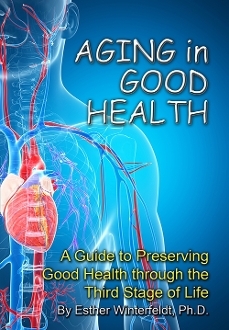 In this book, the emphasis is on mental health and the factors that have been shown to have an effect on the aging process Nutrition is stressed — that is my primary area of interest — but other lifestyle factors are also discussed. Each chapter is fully referenced as to the sources of information. Realizing that our state of knowledge concerning mental health is constantly progressing, there will no doubt be much more yet to be learned. Perhaps the information presented here will spark an interest in delving further. Esther Winterfeldt, Ph.D., is a Regents Professor Emeritus from Oklahoma State University where she was head of the Department of Nutritional Sciences for 18 years. She served as Associate Dean in the College of Human Sciences for three years before pursuing interim department head positions at Auburn University and the University of Texas at Houston. A graduate of Oklahoma State for two degrees and from Ohio State University for the doctorate, she pursued degrees in Dietetics and Nutrition and worked in hospital dietetics at Children’s Hospital in Louisville, the University of Chicago Hospitals and the Ohio State University Hospitals. She then returned to Oklahoma State. Professionally, she has been active in state dietetics associations and in the American Dietetic Association where she served on the executive board several years including terms as president of the association and of the association Foundation. She was named to the Oklahoma Higher Education Hall of Fame in 2002. She has co-authored a textbook, Dietetics and Nutrition: Practice and Future Trends, which is in its fourth edition. Her other publications are Aging in Good Health and Our Food and its Origins. She currently resides in Yukon, Oklahoma.